An excellent monograph with many large scale reproductions of posters, and other applied graphics from one of Germany's leading designers. 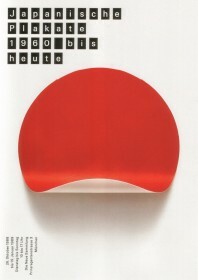 The book opens with a quote from Pierre Mendell's graphic design teacher at the School of Design in Basel, Switzerland, Armin Hofmann "Ideas are the lice of thoughts". As there is very little other text, that short comment gains it's own weight. Mendell also shares his teacher's belief that "the world is flooded by an overabundance of pictures", and therefore a simple, direct approach is the best way to deliver the message. Hence the title of the book "At first sight". Mendell presents his work in the book as "the daily grind of a graphic design studio", some book design, posters, trademark development, corporate identity and wedding announcements for friends. Asked for his design philosophy, he answers "I have none". That's it. The text is as concentrated and clear as Mendell's visual language, the best illustration for the old proverb "A good poster needs no explanation". The figure captions and other necessary details are all at the end of the book, the book design is impeccable and reader friendly. Without further explanations, it becomes obvious that he has been active in graphic design since at least 1962, and you may guess his age from that date. On the other hand there are so many new posters from the last few years, for the theaters and museums in Munich, that his career has probably not yet peaked. Pierre Mendell was born in Germany, grew up in France, later became a naturalized citizen of the United States, returned to France to work in his family's textile factory and finally became attracted to graphic design which he studied in Basel. Between 1961 and 2000, he run the studio "Mendell & Oberer" together with Klaus Oberer, another graduate from the Basel school. Pierre Mendell and Lars Mueller are both AGI members.